Theodor Estermann's parents were Leo Estermann and Rachel Brenner. Leo, who was born in Lithuania, was a Jewish businessman who worked in advertising and management. Rachel, who was born in Latvia, was a corset maker. Leo and Rachel Estermann had two children, the eldest being Immanuel who was born in Berlin on 31 March 1900. 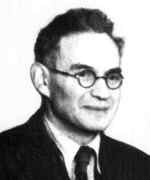 Immanuel Estermann (1900-1973) became an outstanding physicist. Leo Estermann was a Zionist, a passionate believer in the formation of a state of Israel, and strongly opposed to the integration of Jews into the societies in which they lived. In fact he had named his son Theodor after Theodor Herzl (1860-1904) who is considered as the founder of Zionism. Theodor's first schooling was in Hamburg where, from 1908, he attended the Talmud-Torah School, the oldest Jewish school in Hamburg founded in 1805. At this school he learnt Hebrew as well as German, writing and arithmetic. After attending this school for several years, he studied at a state primary school in Berlin. Theodor felt happier in the state primary than he had in the Talmud-Torah School. Here the teachers translated their lesson notes from their own mother-tongues (often German) into Hebrew, and Theodor used to translate his notes back into German when he did his homework. Although the Estermann family remained in Jerusalem for most of World War I, living conditions became very difficult and they returned to Hamburg before the war ended. Few school places were available in Hamburg and, due to their different ages, the brothers had to attend different schools. Immanuel attended a school where he was able to undertake practical science experiments in laboratories but the school that Theodor attended did not have such facilities for science. It seems that this difference between the schools may have led to Immanuel becoming fascinated by chemistry (he later moved to physics) while Theodor developed a passion for mathematics. The Zionist movement believed in a rural way of life with agriculture and rights for those who worked the land being strong beliefs. Because of this, Leo Estermann arranged for his son Theodor to be apprenticed to a farmer after he graduated from the Hamburg high school. However, the farmer quickly realised that his young apprentice would never make a good farmer but had a strong academic desire. He persuaded Estermann's father that he should let his son attend university. Estermann entered the University of Göttingen, the leading German university for mathematics, and there he attended courses by David Hilbert and Edmund Landau. Estermann, however, missed his family and after a few months, arranged to continue his studies of mathematics at the University of Hamburg. Wilhelm Blaschke had been appointed to a chair at the University of Hamburg in 1919. Erich Hecke was appointed to Hamburg in the same year and wanted to build a school of number theory there. In 1922 Hans Rademacher, who had been working on the theory of real functions, was appointed as an extraordinary professor at Hamburg and began to work on number theory. Also in 1922, Emil Artin was appointed as an assistant at Hamburg. Theodor Estermann's brother Immanuel became a lecturer in physics at the University of Hamburg in 1922 and Theodor undertook research towards his doctorate advised by Rademacher. Now although Rademacher was by this time turning towards number theory and Estermann's interests were in that area after attending Edmund Landau's lectures in Göttingen, Rademacher still did not feel confident enough to suggest a number theory topic to Estermann; instead, he suggested a problem in measure theory. Estermann was awarded his doctorate in 1925 for his thesis Über Carathéodorys und Minkowskis Verallgemeinerungen des Laengenbegriffs Ⓣ and, in the same year, he published a paper with the same title as his thesis. While Estermann worked for his doctorate at Hamburg, his father had returned to Palestine which was by this time being administered by the British. After he completed his doctorate, Estermann joined his father in Palestine. Work was not easy to obtain and he worked for a while as an assistant in Dr Arthur Biram's Hebrew Reali High School in Haifa. In March 1926, while in Tel-Aviv, he submitted the paper Zwei neue Beweise eines Satzes von Blaschke und Rademacher Ⓣ to the Jahresbericht der Deutschen Mathematiker-Vereinigung Ⓣ. This paper solves the 3-dimensional case of a problem on convex bodies, the 2-dimensional case having been solved by Blaschke in 1920. I take this opportunity to express my thanks to Mr Titchmarsh for having drawn my attention to the subject and for his kind permission to avail myself of a manuscript in which he proved [a special case of] Theorem 3. The authors of  call this paper "a remarkable piece of work" describing Estermann's proofs "elegant" and "representing considerable achievements". While at University College London, Estermann submitted On a Problem of Analytic Continuation (submitted March 1927) which is also called "a remarkable piece of work" by the authors of . This was a highly productive period for Estermann with papers: Über den Vektorenbereich eines konvexen Körpers Ⓣ (submitted September 1927); On the Representations of a Number as the Sum of Three Products (submitted April 1928); and On the Divisor-Problem in a Class of Residues (submitted July 1928). Although mathematically this had been a highly productive period for Estermann, he found it difficult to live on the small amount of money that his father was able to send him. He was awarded a D.Sc. by University College London and returned to Germany at the end of 1928. Back in Hamburg, he obtained a temporary position substituting for a professor who was ill. He submitted Bemerkung zu den kontinuitätsbeweisen des abbildungssatzes für polygone Ⓣ in October 1928. This remark gives more information about the convex bodies problem he had studied while in Palestine. While in Hamburg, he also submitted the paper Vereinfachter beweis eines satzes von Kloosterman Ⓣ. The professor for whom he was substituting died and so his temporary position vanished. In May 1929 he returned to London for the degree ceremony to receive his D.Sc and when the staff at University College London learnt that he was unemployed, they arranged for him to be offered an Assistant Lectureship in Mathematics. Back in Hamburg before taking up the position in London, Estermann sent off his paper On the Representations of a Number as the Sum of Two Products (a 2-part paper, the first part submitted June 1929, second part November 1929). He took up the Assistant Lectureship in Mathematics at University College London in the autumn of 1929 and, two years later, was promoted to a Lectureship. Being a Jew, Estermann's brother Immanuel lost his position at the University of Hamburg in 1933 when the Nazi party came to power. He came to England in that year and, for a while, lived with his brother. Later he went to Carnegie Mellon University in Pittsburgh in the United States. Theodor Estermann was an invited speaker at the Colloquium on the 'Theory of Numbers' held at the University of Bristol in June 1935. He gave the lecture The representation of numbers as sums of squares. This was an important occasion for him since the lectures given at this meeting by Hans Heilbronn on Waring's problem led to Estermann making some important contributions over the following years, see for example his paper On Waring's problem for fourth and higher powers (1937). Estermann married Tamara K E Pringsheim towards the end of 1936; they had five girls and one boy. Tamara was the grandaughter of Alfred Pringsheim. Their first address was 13 Sandringham Road, Speedwell, London. He was promoted to Reader at University College in 1940. In 1950 he visited the United States sailing from Liverpool to New York on the Britannic, departing 14 July. He lectured at Stanford University while in the United States. He returned to England on the Queen Mary, arriving in Southampton on 19 September 1950. ... main purpose in writing this book was to enable those mathematicians who are not specialists in the theory of numbers to learn some of its non-elementary results and methods without too great an effort. The main purpose of this book is to give a complete account of Vinogradov's famous theorem that every large odd positive integer can be represented as the sum of three primes. It assumes some knowledge of the elementary theory of numbers, for which Hardy-Wright's treatise is quoted, and some of complex function theory. The exposition is very clear and accurate, and also in other respects reminds one of Landau's books. Problems, methods or results which do not directly fit in the author's presentation of Vinogradov's theorem are completely neglected, and, therefore, the title of the book may be somewhat misleading. Nevertheless it gives a good impression of analytical number theory. The exposition is masterly in its clarity, ease and economy. For example, the proof of Vinogradov's theorem takes only 16 pages, which includes a careful explanation of the main ideas before the detailed proof begins. Until I read this book I would not have believed it possible to give so lucid and simple an account of the proofs of these three difficult and important theorems. The author has put specialists as well as non-specialists in his debt. An impression of the areas of number theory that attracted Estermann is gained by looking at the headings under which his research is discussed in . These are: Kloosterman's sums and applications; Sums of squares, quadratic forms; Waring's problem; Sieve theory; Additive problems involving primes; and Siegel zeros and the distribution of primes. This is an excellent book on the foundations of complex analysis. The material covered is, roughly speaking, that required by an honours student in mathematics. The reader is assumed to be familiar with the elements of the theory of real functions of real variables. ... The author's account of Cauchy's theorem is as good as any I have seen. Throughout the book the author avoids any intuitive or formal discussion. This seems to me to detract considerably from the other undoubted merits of the book. While the substitution of intuition and formality for rigour is deplorable, it is nevertheless true that the development of these complementary to rigour greatly increases effectiveness and facility in the subject. In many places some intuitive discussion of the ideas of a proof would have removed much obscurity and apparent arbitrariness. Otherwise the proofs are admirable and are clearly the result of a great deal of thought on the part of the author. During the year 1957-58 Dr T Estermann had two students on his undergraduate course in functions of a complex variable. I had little idea at that time of the significance of being one of those two. When, nearly a decade later, I bought Estermann's book [Complex numbers and functions (1962)], it was mainly for nostalgia's sake since I had given up hope of becoming a mathematician. His matter-of-fact Germanic accent spoke to me again from every sentence in the book. It must be difficult for readers who have never met Estermann to appreciate the author's personality. For example, one reads on page 61 of , 'Jordan's own supposed proof (of the Jordan curve theorem) is ... very inadequate and marred by serious misconception.' Such language might remind one of a certain type of political polemicist, but when uttered by Estermann it sounded more like an apology, addressed to us students by a mathematician, for the shortcomings of his co-workers. I feel that having been a less than adequate student I at least owe Estermann this 'very inadequate' tribute. In view of Estermann's quiet and modest presence, one was surprised on better acquaintance to find that he was in fact a man of wide interests and many accomplishments. He spoke fluent grammatical German and Hebrew (and, of course, English). In addition, he knew some French and Latin, and studied Swedish in preparation for the Stockholm ICM. He had an extensive knowledge of literature, and knew large parts of Shakespeare's plays by heart. He enjoyed classical music, and as a young man was a keen gymnast. Klaus Roth recalls from his research student days that his supervisor, Dr Estermann, could still demonstrate faultless handstands with the same facility with which he made his many erudite (but apt) quotations from Shakespeare and Gothe. In 1965, four years before he retired, University College London promoted Estermann to professor. When he retired in 1969 he was made Professor Emeritus. He continued to undertake research at University College until 1987 where he was appointed as a Honorary Research Fellow. During these years he found a new proof of the irrationality of √2 which has fascinated many mathematicians, see  and .